At least two Florida appellate courts have directly contradicted each other on an increasingly-important question facing Floridians and the insurance industry. The question is as follows: “Are insurance provisions valid which condition the validity of third-party benefits assignments upon the written consent of all insureds and named property mortgagees?” The answer to this question is important because Floridian policyholders often assign their insurance rights to construction companies post-loss to receive services without up-front payment. The Florida Supreme Court was recently asked to answer this important question, and it is likely to weigh in, although it has not yet formally decided to do so. Public policy concerns animate assignment-of-benefits (“AOB”) legal disputes in Florida. Florida construction companies and policy-holder attorneys argue that AOB is good for policy-holders because it allows them to immediately repair damaged property. However, insurance advocates contend that certain AOB limitations are necessary to mitigate abuse, fraud, needless litigation, and ultimately to minimize insurance premiums to policyholders. A 2016 Insurance Journal article explained that unscrupulous contractors often obtain AOBs, submit inflated repair-cost claims to insurers, and then work closely with “highly litigious” trial groups to sue the insurers for denying these claims, whether in whole or in part. Amy O’Connor, Florida Fights Back Against Assignment of Benefits Abuse, Insurance Journal (Feb. 8, 2016). A 2018 article indicates that as a result, the number of AOB lawsuits in Florida has been “spiraling out of control,” from 405 lawsuits in 2007 to 28,000 lawsuits in 2016—a “68-fold increase.” Liam Sigaud, Florida Insurance Abuse Spiraling Out of Control, Pensacola News Journal (March 14, 2018). Thus, the legal AOB controversy currently taking place in Florida is the tip of a much larger public policy iceberg. Because of the breadth and depth of the public policy considerations at play, even those Florida courts which have taken a side have done so on purely legal grounds, recognizing that the complex policy considerations are best addressed by the Florida Legislature. Unfortunately, the Florida Legislature has repeatedly tried yet been unable to resolve the present dispute. Three of the five Florida District Courts of Appeal have weighed in on the validity of AOB conditions requiring the written consent of all insureds and named property mortgagees. The Second Florida District Court of Appeal (“Second District”) upheld the enforcement of such conditions without comment. See Biologic, Inc. a/a/0 Elizabeth Morgan v. ASI Preferred Ins. Corp., 238 So. 3d 769 (Fla. Dist. Ct. App. 2017). The Fourth Florida District Court of Appeal (“Fourth District”) upheld the validity of such conditions with detailed analysis. See Restoration 1 of Port St. Lucie v. Ark Royal Ins. Co., 2018 WL 4211750, at *1 (Fla. Dist. Ct. App. 2018). Finally, the Fifth Florida District Court of Appeal (“Fifth District”) has twice held such conditions to be invalid under age-old Florida common law. Sec. First Ins. Co. v. Florida Office of Ins. Regulation, 232 So. 3d 1157, 1160 (Fla. Dist. Ct. App. 2017); Restoration 1 CFL, LLC v. ASI Preferred Ins. Corp., 239 So. 3d 747 (Fla. Dist. Ct. App. 2018). In invalidating the aforementioned AOB consent requirements, the Fifth District cited a 1917 Florida Supreme Court decision for the very general proposition that “it is a well-settled rule that [anti-assignment provisions do] not apply to an assignment after loss.” Sec. First Ins. Co., 232 So. 3d at 1158 (quoting from W. Florida Grocery Co. v. Teutonia Fire Ins. Co., 77 So. 209, 210–11 (1917)). However, the Fourth District subsequently disagreed, holding that the Fifth District overgeneralized the Teutonia Fire rule, which invalided a clause requiring the insurer to consent to third-party benefits assignments, not other insureds and property mortgagees. Ark Royal Ins. Co., 2018 WL 4211750, at *3. AOB consent from an insurer constituted a needless restraint on the insured’s right to assign benefits because the insurer had no interest in the assignment. Id. Thus, the insurer-consent requirement was “superfluous.” Id. In contrast, says the Fourth District, requiring the consent of other insureds and named mortgagees is not superfluous because they have a “a vested interest that a reputable, legitimate third-party contractor perform repairs on the home.” Id. The Fourth District recognized that freedom of contract may be limited where it would impose “great prejudice to the dominant public interest,” but declined to find any such prejudice because “[t]he contract here does not prohibit assignment—it imposes a condition, requiring the approval of all insureds and the mortgagee.” Id. at 4. In sum, the Fourth and Fifth Circuit’s disagreement stems from differing opinions about the scope of the Teutonia Fire rule. Noting this conflict, the Fourth Circuit “certify[ied] conflict” for purposes of appeal to the Florida Supreme Court. Id. Interestingly, the Fourth District’s opinion was appealed by the underlying winner—Ark Royal Insurance Company. In mid-October 2018, the loser, Restoration 1 agreed with Ark Royal that the Florida Supreme Court should take up the case to provide unity in Florida on the issue. The Florida Supreme Court has not yet determined whether to take up the appeal, although the circumstances suggest that it is likely to do so. Indeed, a former Associate Justice—Ken Bell—recently authored an article indicating that the Florida Supreme Court should and will take up the appeal and side with the Fourth District. Ken Bell, AOB Issue Finally Headed to Florida’s Supreme Court, Insurance Business America (Oct. 11, 2018). Importantly, the seven-member Florida Supreme Court is about to change significantly. Justices Barbara Pariente, Fred Lewis and Peggy Quince will be leaving the court in January 2019, having reached the applicable state judicial age limit. Lloyd Dunkelberger, Florida Supreme Court direction hinges on governor’s race, Orlando Weekly (October 23, 2018). These justices are considered to be policy-holder friendly. Newly-appointed Republican Governor Ron DeSantis, who will take office in January 2019, has the power to make new appointments. Id. The AOB appeal, which was filed in late September 2018, will likely be decided after this seismic judicial shift takes place. These changes are likely to work in favor of insurers with regard to the AOB appeal. 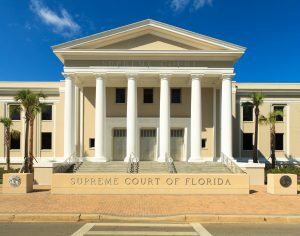 Until the Florida Supreme Court resolves the present AOB debacle, the law is likely to be treated in a piecemeal fashion across the state, depending upon where suit is filed. Cases filed in the Fifth District are subject to binding Fifth District precedent, and insurer/mortgagee-consent requirements will likely be found invalid. Insurers in these jurisdictions cannot rely upon insurer/mortgagee-consent failures to function as a proper basis for denial and to shield them from liability. The relevant counties in which this is the case are as follows: Citrus, Hernando, Lake, Marion, Sumter, Flagler, Putnam, St. Johns, Volusia, Orange, Osceola, Brevard and Seminole. The opposite is true in the Fourth District. Insurers can rely upon insurer/mortgagee-consent failures to function as a proper basis for denial of a claim by the assignee, as well as to shield them from liability that would otherwise flow from such a denial. The counties in which this is the case are as follows: Palm Beach, Broward, Indian River, Martin, Okeechobee and St. Lucie. In this regard, the Fourth District’s approach is arguably more important than the Fifth District’s approach, as the majority of AOB abuse is concentrated in Southern Florida. Insurer’s should tread carefully in the Second District, including the following counties: Pasco, Pinellas, Hardee, Highlands, Polk, DeSoto, Manatee, Sarasota, Hillsborough, Charlotte, Collier, Glades, Hendry and Lee. Although one Second District opinion enforced an insurer/mortgagee-consent requirement, it did so without comment. Because it did not reason out its judgment, it is very difficult to gauge the Second District’s commitment to the position it has so far taken. Nevertheless, applicable case law favors the validity of insurer/mortgagee-consent requirements in Second District counties.